In the wild, Sugar Gliders are omnivores and eat a vast variety of foods including many types of insects and arachnids (e.g., spiders), and tree gums, nectars, and saps. The diet varies depending upon the season of the year and the availability of food. Sugar Gliders kept as companion animals are prone to two main nutritional problems. Low Calcium Levels: A diet too low in calcium can lead to bone and dental disease. Insects in general, are low in calcium, so they should be gut loaded with a high quality diet containing additional calcium. 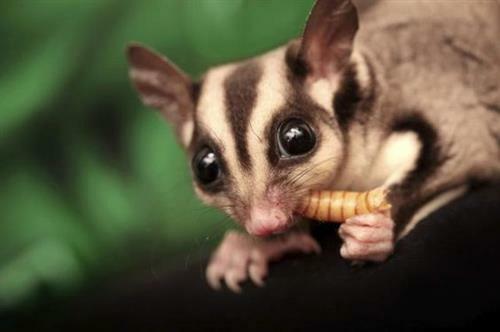 This means that insects, such as crickets, must be fed a special supplement prior to feeding them to the Sugar Gliders. These calcium-supplemented diets are available commercially. Fruits and vegetables are also low in calcium and higher in phosphorous. These, too, should be given in limited amounts. Obesity: One of the biggest mistakes is to believe that since they are called Sugar Gliders, their diet should be high in sugar. Nothing could be farther from the truth. Feeding a diet too high in fat and sugars can lead to obesity and breeding problems. Fly pupae and mealworms are especially high in fat and should only be fed as a small part of the diet. Protein is an essential part of a Sugar Glider's diet, and high protein foods need to be fed. Sugar Gliders in the wild consume 15-20% of the Sugar Glider's body weight daily. Pet Sugar Gliders expend fewer calories than those in the wild since they are not foraging for food. The diet of pet Sugar Gliders is also more easily digested and absorbed than the diets in the wild. For these reasons, great care must be taken to not overfeed pet Sugar Gliders and they should be monitored regularly for weight gain. Sugar Gliders are nocturnal, so it is generally recommended that they be fed at dusk. If they appear hungry during the day, you may split the meal, giving most of it at night, and a small amount in the morning. Since they live in trees, it makes sense that they would prefer eating up high, rather than having the food bowls on the floor of the cage. Mounting the bowls toward the top of the cage will also help keep them more clean. Variety is the key to proper nutrition. By feeding a variety of foods, nutritional imbalances are less likely to occur. Some owners have reported that their Sugar Gliders have become finicky, so variety, especially at a young age, will keep them interested in many different foods. When feeding a Sugar Glider, be sure he does not simply pick out his favorite foods and leave the rest. Finely chopping and mixing the food will help assure he eats a variety. 1. A noticeable reduction or increase in appetite or thirst. 2. Reduction of physical activity and lack of play with other Gliders. 4. Weakness, coordination problems or paralysis. 5. Signs of injury such as tears in the membrane, wounds, sores or abscesses. Allow us to help you with your Sugar Glider husbandry issues. The informative pages listed in our department titled 'Basic Sugar Glider Information' contain quality information to guide you in the care and raising of your pet Sugar Gliders. Take the time to read through this important information, preferably before you purchase a pet Sugar Glider. Articles on Sugar Glider food, Sugar Glider cages, and suggested veterinarians are listed, along with breeding information and purchasing guides. Being informed on the care and breeding of Sugar Gliders will benefit both you, and your new pets. It will also help you avoid health issues with your Sugar Gliders in the future.